In the last five years, the American craft whiskey scene has exploded, with a new distillery popping up almost every week. I have had the chance to try a number of very good craft whiskeys, as well as some whiskeys that have been very disappointing. Generally speaking, the problem with artisan distilleries (i.e. new, fairly small distilleries) is that they are financially obliged to sell their products as soon as they can to make a profit, which means they are often stuck selling whiskeys that are too young and overpriced. Such are the perils of opening a distillery; it costs a lot of money to start one, and it takes time to make really good whiskey. However, that does not mean that all craft whiskey is sub-par and overpriced. Over the next few reviews, I will be reviewing whiskeys from Corsair Distillery in Tennessee and Balcones Distillery in Texas, both distilleries that are doing some very exciting things in the whiskey world. 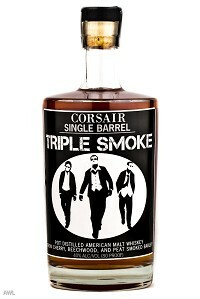 Today’s review is of Corsair Triple Smoke, a small batch, American malt whiskey. The name “Triple Smoke” comes from the fact that this whiskey is made from 3 different types of barley – peat-smoked barley, beechwood-smoked barley, and cherrywood-smoked barley. I suspect that the barley is sourced and not malted on site, but I am not sure on that one. The whiskey aged in new, charred oak barrels, but there is no age statement on the bottle, so I don’t know how old this whiskey is. My guess is that it is around 18-36 months old, but I would be much obliged if anyone had more info on that as well. The whiskey is then bottled at 80 proof (40% abv) and released in small batches (this review is of batch #84). I think if I smelled this blind, I would think I was drinking a very young Islay whisky. The nose is warming and peaty, but it also has notes of barley, olive oil, and the earthen woodiness of a deciduous forest. The palate is medium-bodied and surprisingly complex. The peat forms the backbone, but there are also notes of maple bark, oak, sweet bread, and a whiff of vanilla. The finish is medium-long, and balances peaty notes and woody notes very well. The whiskey certainly tastes young, but I don’t believe that is always a bad thing. Overall, this is a young, brash, yet very good peated American whiskey. I know that not everyone will like this whiskey, but I certainly do. It is smoky, woody, brash, but still refined enough to make a wonderful pour. I would love to see what this whiskey would look like if it were aged to 6 or 8 years old. This is the first whiskey I have reviewed from Corsair, and I hope to review some more. I really enjoy the Triple Smoke expression, and I cannot wait to see what else Corsair is coming up with. My grade: B+. Price: $45-50/750ml. This is a bit pricey for a whiskey that probably is not three years old, but I believe that the whiskey in the bottle is a very good find, indeed. Give the craft whiskey boom a try, and let it ride!